Walked over to the St. Lazare train station to get our car and then get outta Dodge. 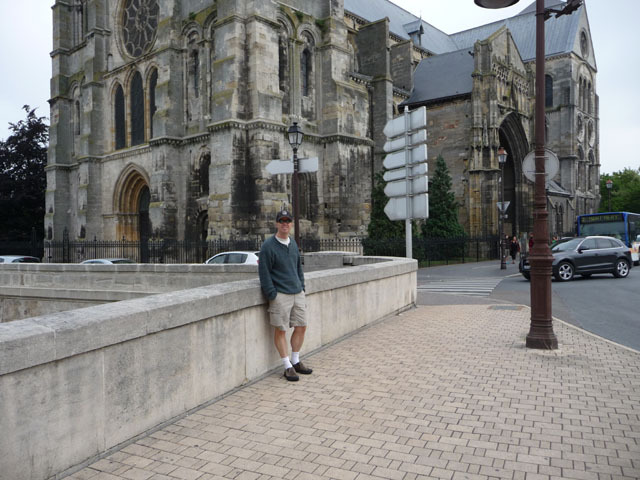 Jeff navigated us through Paris and down the Champs-Elysees without any problems. Last trip I was navigator. Not usually a good thing for the one who gets car sick reading the map. Of course once we were on the road, we had to make our lunch calculations. The French all take lunch and it is at lunchtime. The destination was Chalons-en-Champagne. Plenty of options. Drove to the centre ville, parked et voila. We had a very good landmark, the Notre Dame Chalons-en-Champagne. 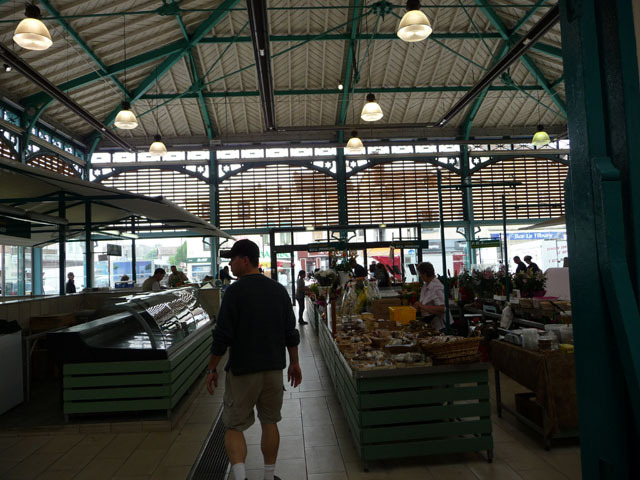 The weekly market was going on so we had a walk through. We opted for a light lunch at a brasserie. Of course the salads were loaded with cured pork product. Mmm. Back on the road. 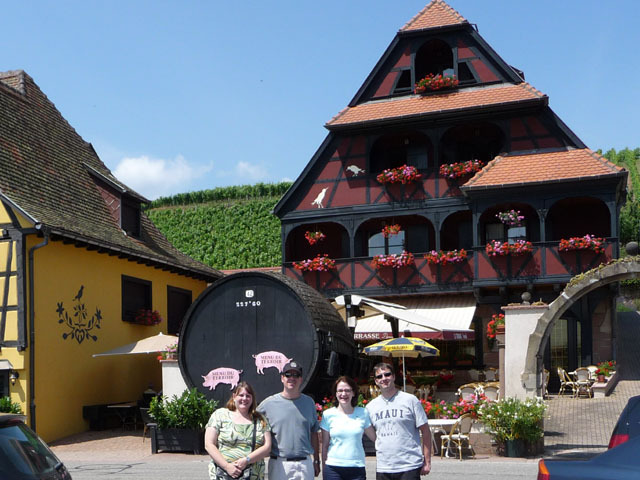 About 5 hours from Paris, many tolls, long tunnel and bam, we are in Alsace. 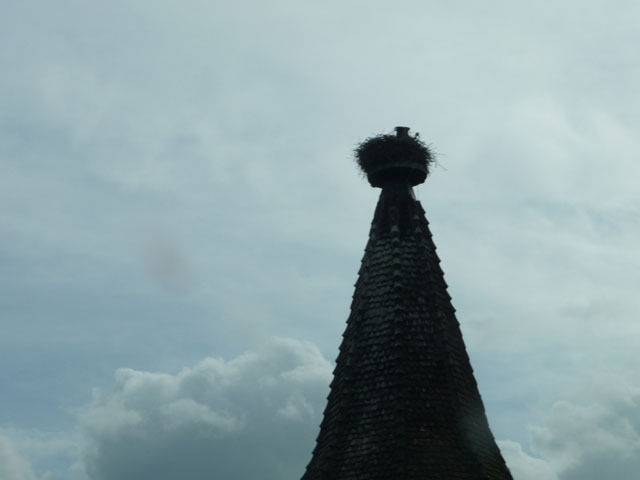 We had the the traditional sighting of the storks to greet us. Our end destination, Riquewihr, is a very darling town. Totally touristy. 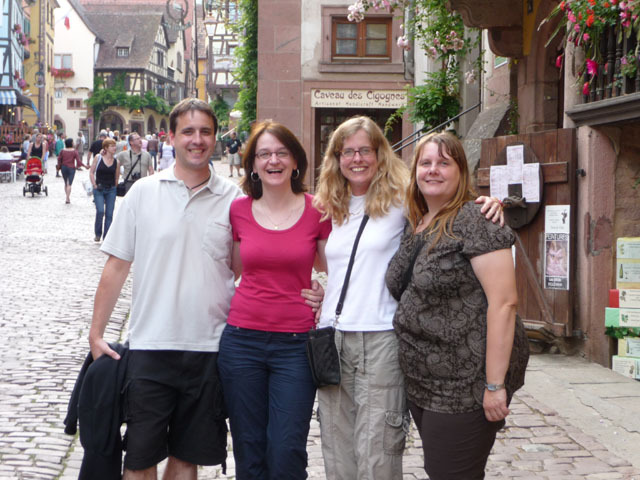 This is where we meet up with Birgit, Holger, and Michaela. A little walk about town. Sit and visit with some drinks. Then get ready for dinner. 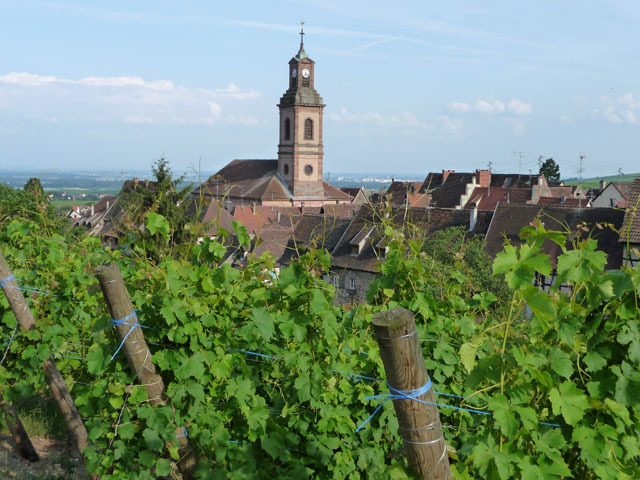 We are off to Caveau d'Eguisheim. Jeff and I went here in 2000. It now has a 1 star. The hostess/waitress/steward was very funny. She asked if we spoke French and was relieved when we said yes. We did the best we could with the menu for Birgit, Holgar and Michaela. French to our English to their German. It worked. Birgit got the pictures (I was busy eating). The waitress explained the specials verbally. Jeff and I got what we could. Some don't translate pretty. We all got the same amuse of gazpacho (a bit off putting with the cumin). Anyway our waitress "guilted" Jeff and I into some of the specials. Jeff had the crustecean stuffed zucchini flower with a tangy mushroom "salsa" and then the pork trotters wrapped around ris de veau. Beyond rich. I had foie gras special. It was giant. Then I had the squab with the most perfectly cooked spring vegetable tartlette. The gang all got the lobster ravioli with a gorgeous saffron sauce. Birgit and Michaela had the scallops with cepes gnocchi (yum) and Holger the cod with artichokes. Holger got the winner dessert of strawberries with very thinly sliced blanched tomatoes and basil and mint. The chocolate for Birgit and Michaela was very rich and heavy. Too much after the rest of the meal. Jeff had sorbet of Marc d'Alsace. I had a meringue filled with sorbet and rhubarb. We had two different Pinot Blancs. Nice evening and we closed down the place. We didn't want to start too early for Michaela and Holger. 10 we met to begin the day. A stroll to the main avenue and some coffee and croissants. Then it was off the Rodern, the center of Pinto Noir for the region (not the most prevelant grape in the region). It being Sunday, many places are closed. We parked and walked into a degustation that was open, Koeberle Kreyer. The gal was very nice, very helpful. She spoke perfect German. So we were all happy. We ended up with a 08 old vines and 06 eleve en barriques Pinot Noir and a 02 VT Pinot Blanc. It was time for lunch and the drive to Itterswiller. After a small diversion, we ended up on the hilltop with the great view. Hotel-Restaurant (Winstub) Arnold. Choucroute was the order of the day. It was a nice leisurely afternoon. 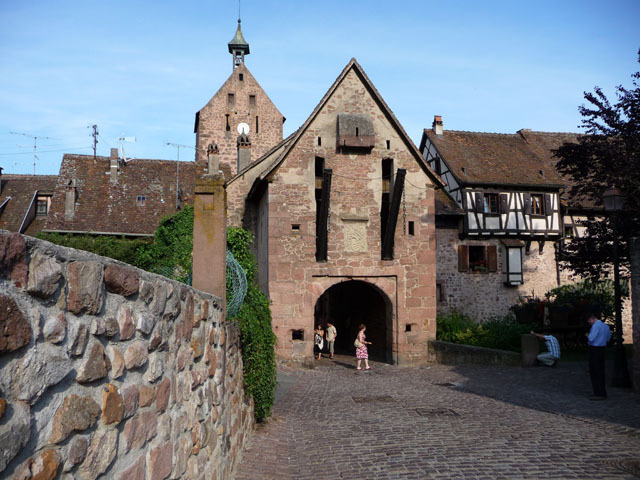 Back to Riquewihr. 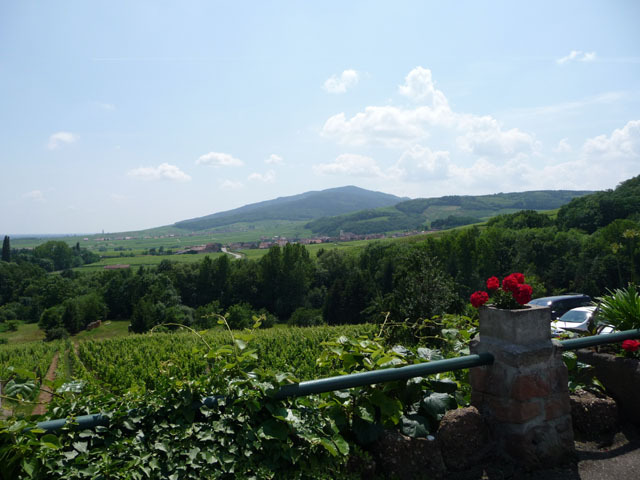 We had a degustation at Hugel in the town. The poor tasting room gal (a family member) was totally haired. We ended up with the estate gewurtzraminers, 05 Jubliee, 01 VT and the 98 Hommage Jean Hugel. It wasn't quite time for the German contingient to leave, so we went to the brasserie for cold drinks and some more visiting. They left at 6ish. 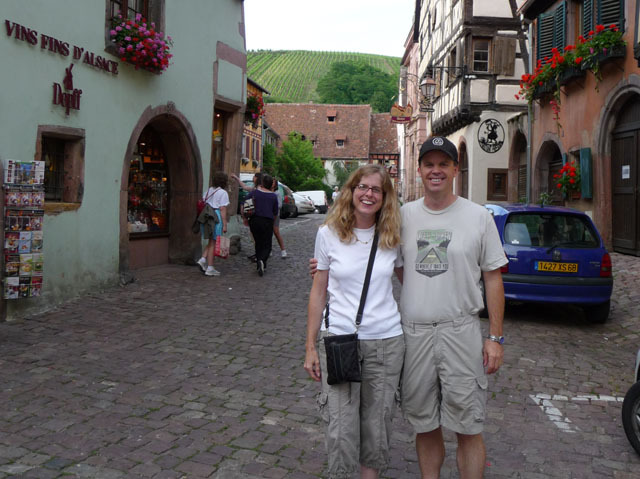 Jeff and I had a little walk in the vineyards and town. We wanted something light for dinner. Ha! So we wandered around, smelled our way to tarte flambee. This was great, but we shoulda split it. Bread board of super thin "crust" with cheese, onion and pork product (the specialty of the region, bien sur), salads and a riesling. Leisurely meal on the outdoor living room. Some research into tomorrow's actvities. Yes, more wine and food.